Manchester United may not be signing Mesut Ozil this month as reports in the Express suggest that the German playmaker is thinking about signing a new deal at the Emirates Stadium, which will put paid to our interest in the 29-year-old. The player has thus far refused to sign an extension on his current deal, as he has questioned the club’s inability to compete for the major trophies and attract the best players around. Teammate, Alexis Sanchez is closer to the exit door but it seems Arsenal will have Ozil playing in their colours next season. A reunion with José Mourinho has been mooted, but the player and his girlfriend, Amine Gulse purchased a house in London, and the prospect of changing cities and settling down is a difficult proposition for the former Real Madrid man, who is known for his quiet and family-oriented lifestyle. It is believed Ozil has not closed the door on signing a new contract with The Gunners, but wants a 30% increase on his £140k-a-week deal, and would like the no. 10 jersey at the club, currently occupied by England’s Jack Wilshere. 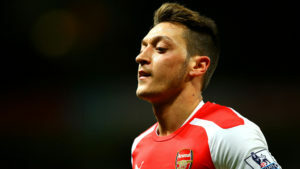 Manchester Evening News reports that Ozil wants reassurances about the ambitions of Arsenal before penning a new deal. He is free to sign a pre-contract agreement with foreign clubs but unlike Sanchez, is still committed to the club with his displays and still gives his all anytime he pulls on the jersey. Ozil is an attacking midfielder regarded as one of the best players in his position, and has made over 200 assists in his career, which has become his trademark.